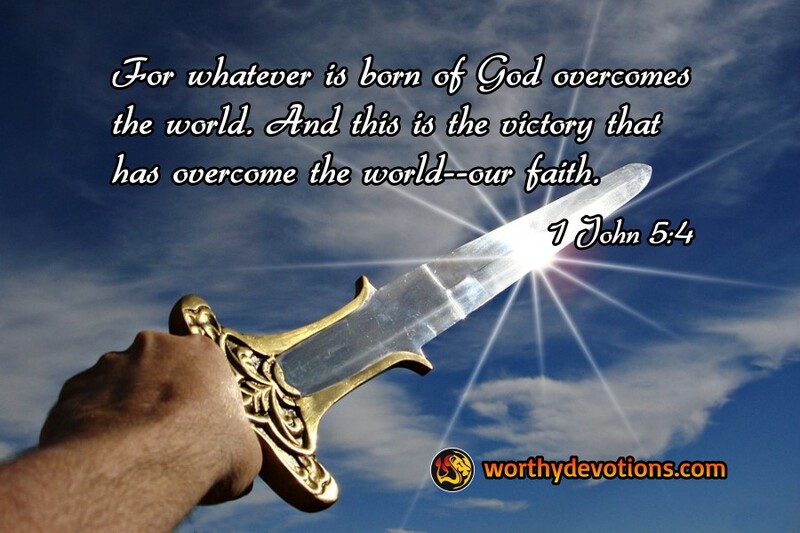 1 John 5:4 For whatever is born of God overcomes the world. And this is the victory that has overcome the world--our faith. As we are entering some of the most turbulent times in history, we've been receiving an unbelievable amount of email expressing concern about the future. But I want to tell you a little something -- the future is VICTORY! It's not defeat or loss. If you think about it, all the great leaders of the Bible shone in the hardest of times. When the giant Goliath stood against the army of Israel, David didn't sit around with his brothers complaining about how big Goliath was. Though David was a dwarf next to this evil giant, he was still convinced he was going to be victorious because God was on his side! When the apostles saw Yeshua die, they must have felt utterly defeated -- then, suddenly, there he was, out from the grave, gloriously alive before them -- and from then on they walked in His victory! They didn't sit around complaining about Roman persecution, the Sanhedrin, or the Pharisees. They didn't get wrapped up in how evil the world was becoming; instead, they pressed forward in the worst of times and in those dark days they shone like the stars in the midnight sky. In the face of everything that's happening around us, let's be sure we're not developing a defeatist attitude. We are called children of the King, a royal priesthood, and a holy nation. Despite how bad things may be getting -- don't forget we're on the winning team! We can stand against this evil and overcome it... with good! Thank Jesus for His resurrection that has declared the eternal defeat of the Devil. Its hard when everything around seems bleak and discouraging...but thank you for the encouraging word - word of truth. All else is temporal..only the victory of Jesus is everlasting! Even with all the terror around us. Christ is sufficient for our victory! Adeyemi from Nigeria. Father lord Jesus Christ you are all sufficient for me I thanks you for making me to be on the wining side by your grace. Thank you so much for this timely encouragement! Well needed! STANDING ON SOLID GROUND! Shalom!